D’Arcy Gray joined the Symphony Nova Scotia administrative team as Education and Community Outreach Coordinator in March 2016. D’Arcy is a very versatile musician who has played a great deal of orchestral, solo, chamber music, interdisciplinary, and free improv shows in many countries over the last 20 years. Originally from Amherst (well, Tidnish actually) here in Nova Scotia, he studied percussion at McGill University and the Juilliard School. He also studied electronic music with David Tudor in New York and at STEIM in Amsterdam. In the last 10 years he has given first performances of over 100 new pieces. As an educator, D’Arcy has been teaching at the university level since 1991. He has been a guest artist or given workshops at many prestigious institutions like the Banff Centre, New Music Concerts, Conservatorium van Amsterdam, Cal Arts, and the Lincoln Centre Institute. 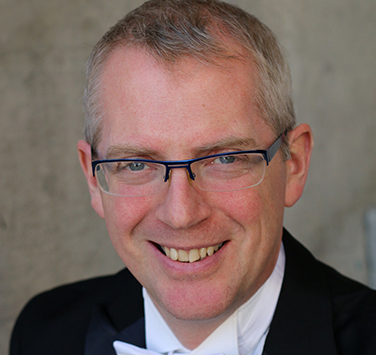 He taught percussion at McGill University from 1991-2008. D’Arcy moved back to Nova Scotia in 2008. Since then he has mostly been teaching at Dalhousie University (The Fountain School of Performing Arts), playing as an extra with Symphony Nova Scotia, and enjoying other collaborations with Suddenly Listen, MusIkon, and many other local artists. I’ve played percussion in some form for about 45 years. Oh my goodness! Well, my mom played the piano and my older brothers played the clarinet and trumpet. My dad and the dog sang (equally well, but don’t tell the dog that!). Obviously, the family needed a drummer. Can you tell us a humorous anecdote about your experience with the Symphony? Well… a couple of years ago when we were rehearsing for Beer & Beethoven I got my pant leg caught on the bass drum stand. The result was me and the crash cymbal I was holding, well, CRASHING to the ground. That may seem funny by itself, but the real funny part was that nobody noticed. It’s amazing how focused the Symphony musicians can be! Symphony Nova Scotia is the only organization of its kind east of Quebec City. A fully professional, full-time symphony orchestra is a powerful thing in a musical community. The players in the orchestra play other gigs, teach, and generally spread a love for music everywhere they go. I volunteer 25-30 days per year with the Canadian Association or Disabled Skiing and the Canadian Ski Patrol. I LOVE to ski, and both these organizations give me a chance to ski and help people at the same time. I don’t know about “best” so let’s go with “most memorable”. In about 2003, I was asked to perform live electronics at the opening of an Architecture Festival in Montreal. Next to the performance space was a long canvass tunnel where attendees were invited to paint. There was an open bar for the guests who were painting. I still have a favourite pair of shoes that has a small patch of blue paint from that night.